I love food too much – both raw and cooked – to sign up to the raw food-movement full time. I’m happy though, to incorporate raw food as part of my diet – especially in the summer when it is hot outside. Whether you are on a raw food diet or not, this cold avocado and spinach soup is a really fresh, light and immensely healthy soup – and it’s surprisingly filling. To make it more of a meal you can combine the soup with a salad and/or some good bread. If you want to make the meal a complete raw food meal, you can combine it with salad like my super delicious Orange and Tomato Salad. I am a HUGE lover of avocados and eat half an avocado on most days of the week – if not in a salad or in a soup like this one, then sliced on top of rye sourdough bread. Avocados are rich in heart-healthy unsaturated fat and vitamin E. Spinach is simply a nutritional goldmine (see Nutritional Information). The combination of the two - together with all the other ingredients – makes for a super-healthy soup. 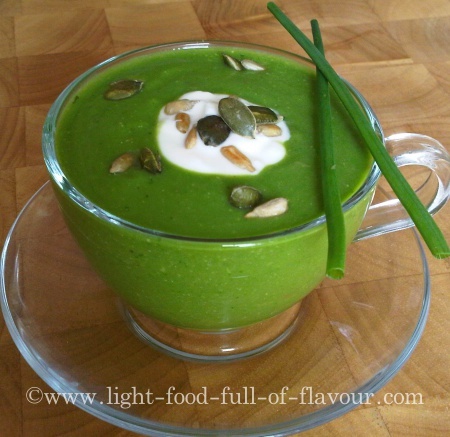 I serve this avocado and spinach soup with a dollop of natural yogurt and dry-roasted pumpkin and sunflower seeds. If you are a raw-food follower, you’d obviously have to use un-roasted seeds. Topping the soup with pumpkin and sunflower seeds will add a lot of healthy nutrients to the soup. Between them these two seeds are rich in essential Omega 3 and Omega 6 fats plus several vitamins and minerals. Pumpkin seeds are also protein-rich and will help to make you feel fuller on less food. Alternatively, you could serve the soup with some crumbled feta cheese (use a good one made from sheep and goat’s milk), chopped chives and pumpkin and sunflower seeds. Place all the ingredients in a food processor or blender and blend until smooth. Check the seasoning and serve with yogurt and seeds, or feta cheese, chopped chives and seeds.